Pointing to busy roads and crowded schools, some candidates in this year's Montgomery County primary election say the county is growing too fast. But people are going to come anyway, making the real issue where that growth should happen. Montgomery County's urban and newer suburban communities are growing, while older suburbs are slowing down. Image by the author. In 2006, voters weary of the housing boom brought in a county executive and several councilmembers who promised to slow things down. The recession made people hungry for investment again, especially on the poorer eastern side of the county, but some residents and candidates this year are arguing that the county's still growing too fast and that developers need to "pay their share." Today, Montgomery has just over one million residents, adding about 100,000 residents between 2000 and 2010, a rate of 11%. That might seem like a lot, but it pales in comparison to most of the 20th century, when the county added as many as 180,000 residents each decade and doubled in population during the 1950s. 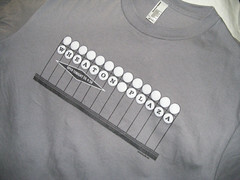 In recent years, the county's grown slower than many other parts of the region, including the District and Arlington. 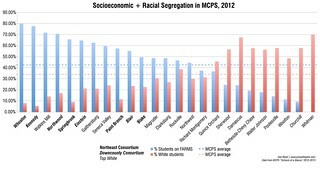 According to the 2000 Census and 2008-2012 American Community Survey, most parts of the county aren't changing that much. Many of the county's older suburban and rural communities, from Chevy Chase to Poolesville, saw little increase in population over the past decade, and in some cases even lost people. 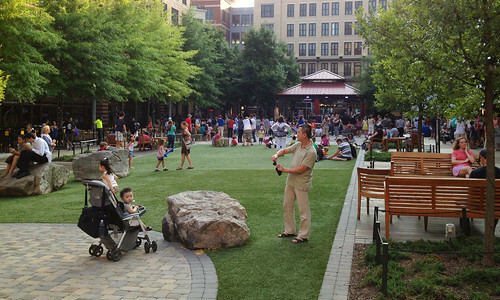 Instead, much of the county's growth is going to its downtowns, like Bethesda, Wheaton, and Silver Spring, which doubled in population between 2000 and 2010. Dense, walkable neighborhoods like Kentlands in Gaithersburg and King Farm in Rockville also had substantial growth. These places already have infrastructure like schools and transit in place, as well as nearby shopping and jobs so new residents don't have to drive or drive as far. 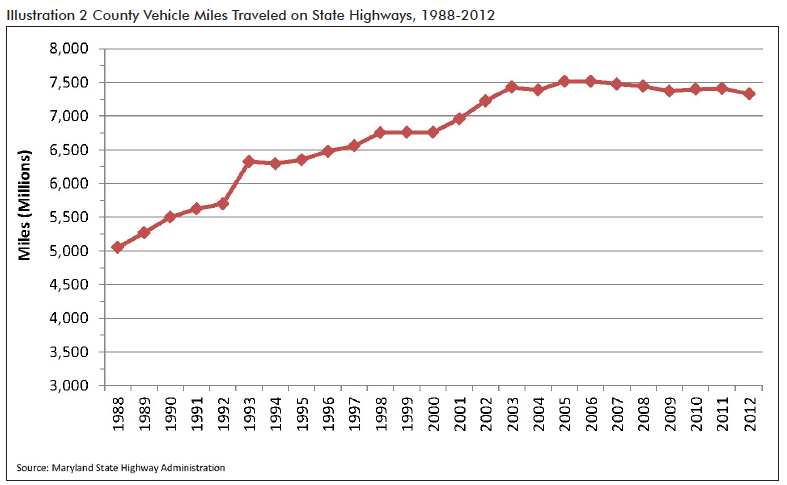 That's how the county could grow while driving rates have stayed at 2002 levels. Fortunately, the county's urban, walkable places will receive most of its growth in the future. Clarksburg's exploding, but the services haven't caught up yet. Photo by the author. But growth is still happening in areas far from amenities and transit. 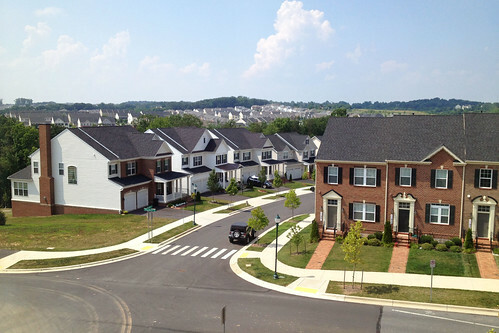 Clarksburg quadrupled in population between 2000 and 2010, making it the county's fastest-growing community. Though it added 9,500 residents in 10 years, Clarksburg didn't even have a grocery store until last year, has overcrowded schools, and few transit connections to the rest of the county. Some candidates this year blame new development on rising enrollment in Montgomery County Public Schools, which is adding 2,000 kids each year. In a campaign video, at-large challenger Beth Daly describes driving past a school with portable classrooms. She and her kids shake their heads. "Doesn't the county know that additional growth requires additional infrastructure?" she asks. Slowing or even stopping new development won't change this. Developers have to pay "impact fees" to cover the cost of schools and roads near new construction, but the county doesn't collect anything in places where nothing's being built. 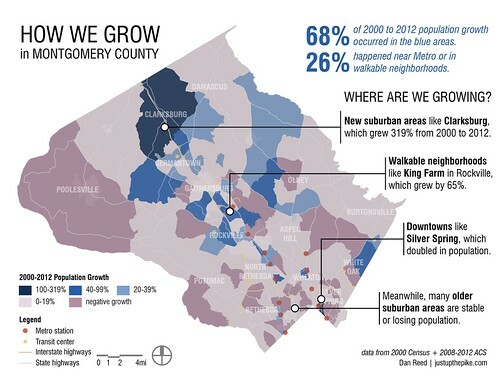 In many ways, Montgomery County has moved past the "growth-vs.-no growth" debate, which at-large councilmember Hans Riemer calls "outdated." Riemer and fellow at-large councilmember George Leventhal have talked about the benefits of new investment, whether it's paying for the things people want and need, like schools and transit, or the ability to attract younger residents. It's also easy to see the consequences of restricting growth in places like East County, which was in a development moratorium for many years due to traffic concerns. There aren't any portable classrooms at Springbrook High School in White Oak, which has over 400 empty seats. Burtonsville's village center has been hemorraging businesses since a highway bypass opened, and abandoned or unkempt houses aren't an uncommon sight in neighborhoods still wracked by the recession. It's no surprise that residents support plans to create a town center in White Oak. Building in the right places is the way to manage growth, not simply slowing it down. Photo by the author. Directing growth to our town centers and areas near transit can meet the demand for new housing and give people what they want. But it also reduces the pressure to develop other parts of the county, whether it's suburban neighborhoods, our agricultural reserve, or our parks. That's the real solution to growth: making it easier to build in the right places, so we can provide the infrastructure and be able to pay for it. It may be more complicated that saying "slow down," but it's ultimately the best path for the county's future.